No matter the stereotype, summers are dry in Oregon and gardens need to be watered regularly, especially in times of drought as the forecast calls for this year. Information is available from the Oregon State University Extension Service publication, “Growing Your Own,” a practical guide to gardening for first-time gardeners that can be accessed online. Soil type is an important factor, according to Extension experts. Water soaks into and drains through sandy soil about twice as fast as it does clay soil; it takes longer to water to a specified depth in clay soil. Loam soil consists of both clay and sandy soil, so water drainage lies between the two. 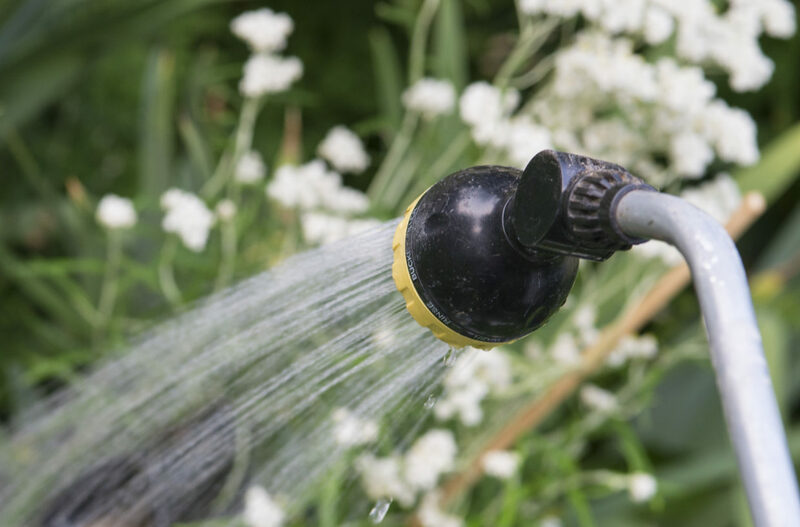 You can water by hand with a hose or a watering can, with soaker hoses and drip irrigation systems and with portable sprinklers. Hand-watering delivers water directly to the plants, eliminating waste. Be sure to take your time and water deeply. Spot checks will indicate if you are delivering enough water. Drip irrigation systems require an initial investment of time and money, but, once installed, are more convenient and conserve water. A typical drip system is run one or two hours once or twice a week. Avoid the tendency to overwater with drip systems; the surface may look dry while the rooting zone is wet. If in doubt, check the soil with a screwdriver or other implement. The pattern of soil wetting with drip irrigation is different for sandy and clay soils. In sandy soil, the water soaks straight in, wetting a narrow vertical band of soil. In clay soil, the water spreads more horizontally. Thus, drip emitters can be placed farther apart for clay soil than for sandy soil. Sprinklers tend to waste water by watering paths and other bare spots in the garden. To avoid losing water to evaporation and wind drift, always water when there is little wind. Because they wet foliage, sprinklers also can promote development of leaf diseases. If using oscillating sprinklers, elevate them above the tallest plants so the water streams are not blocked and their patterns overlap. Runoff indicates you need to water at a slower rate. Consider your soil, your plants and recent weather when determining how much and how often to water your garden. Sandy soil holds much less water than clay soils. Larger plants consume more water than seedlings. Hot, windy weather dries out the soil. Instead of developing a watering schedule, monitor your garden to determine watering needs throughout the growing season. Different plants have different needs. Germinating seeds and seedlings need to be kept uniformly moist and not washed away; water them with a gentle spray every day or two. Developing plants need to be watered deeply, but less often, to encourage deep root growth. Water to a depth of at least six inches and then let the surface inch or two completely dry out before watering again. Crops such as lettuce, beets, green beans and chard draw water from the top foot or less of soil. Thoroughly soak the rooting zone and then don’t water until the plants show signs of needing additional water such as turning a dark bluish green or wilting during the hottest part of the day. Corn, tomatoes, asparagus and rhubarb have deep root systems that allow them to draw water from the top two feet of soil. Deep-rooted plants need water less frequently, but need more water to reach the rooting depth. As a general guideline, garden plants that have been watered properly, and therefore have developed deep roots, need a thorough watering every five to seven days in hot weather. Frequent, shallow watering promotes shallow roots that are susceptible to drought. Overwatering can fill soil pores with water, leaving little or no oxygen for roots and leaches away nutrients. Postponing irrigation after plants show signs of needing water can damage plants quickly in hot weather. Observe your plants every day or two and respond to their needs promptly. It is important to water plants during summer as it wants water to renew itself, we must check regular water for plants.